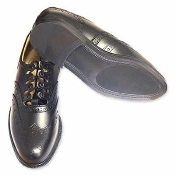 Synthetic Rubber Sole Ghillie Brogue Shoe is a popular and economical choice for your Highland Dress Outfit. Newest ghillie brogue from Gaelic Themes. The Endrick has a full leather upper, synthetic sole and linings. Padded top line and a cushioned heel for added comfort. Ghillie Brogue Shoes, Ghillie Brogues are the most popular shoes worn with Highland Dress. They are open-fronted and have long laces that wrap around the ankle to tie, in the traditional style.